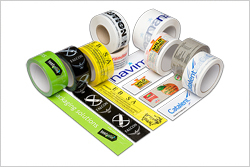 Tamper evident tapes - Tamper seal tapes are designed to indicate or reveal if a seal has been broken by making it extremely difficult to match a pattern once it has been cut or by revealing words. Custom print tapes are available. Security hidden message/pattern reveals and physically remains on lift label, the other parts will be transferred on to the application surface with effect of hollowness when removal is attempted. Security hidden message/pattern reveals on lift label and itself transferred on the application surface when removal attempted.